Remember the Katanga Uno? Yes, the same Harley-Davidson Street 750 that you've seen here few months ago. Then you'll also remember the guys who made that motorcycle - Motomiu. These guys have the knack to take a Harley and turn it around on its head to make some of the most incredible motorcycles we have ever seen. They've been doing this for over two years, and we've been a fan of all the motorcycles they've made so far. 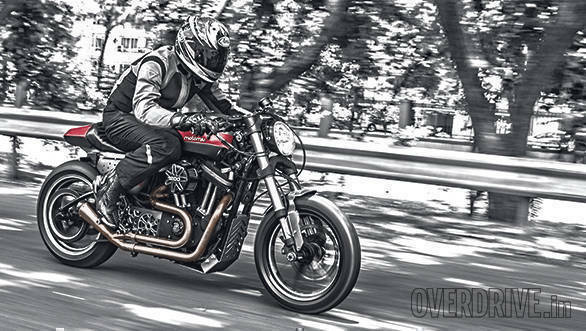 Well, the boys are back at it again, and their new project is a Harley-Davidson Forty-Eight that now looks nothing like a Forty-Eight or a Harley-Davidson for that matter. The Motomiu Sabretooth has no similarities to its donor bike unlike the Katanga Uno. Except for the engine maybe. It sticks out like a sore thumb everywhere. It is the fluorescent yellow in a sea of black. It is the smell of bacon in a tam-bram household. It is the punk rocker in the middle of a symphony orchestra. But the build was a tricky one. Motomiu likes its motorcycles to look like motorcycles and remain functional too. Factors like the weight of the motorcycle, the output generated by the engine, aesthetics and how to get maximum output from what we've in hand were kept in mind. And within those set parameters, a sort of new-age cafe racer design was decided to be the best option. The build wasn't easy and presented its own set of challenges. Getting the rear sets right and choosing the right geometry and weight distribution all meant that a lot of parts had to be fabricated. 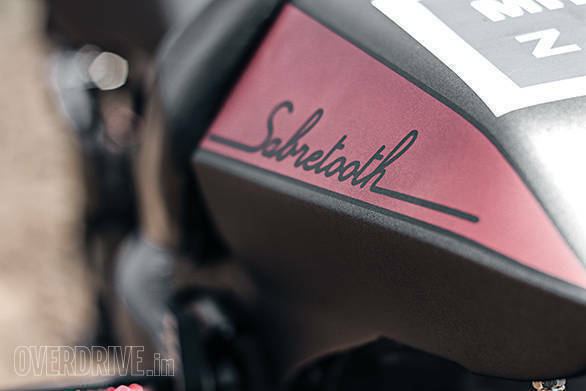 So most of the bits and pieces on the Sabretooth had to be machined in-house by Saurabh Shirke, Arjun Bafna and their team at Motomiu. Aluminium CNC milled top trees, clip-on handlebars, adjustable rear sets, front sprocket cover and derby cover are all made in-house. They've also custom made the new fuel tank, rear subframe and SS oil tank. Over the two months that it took to finish the build, they replaced the front fork assembly with a new upside-down unit from WP. 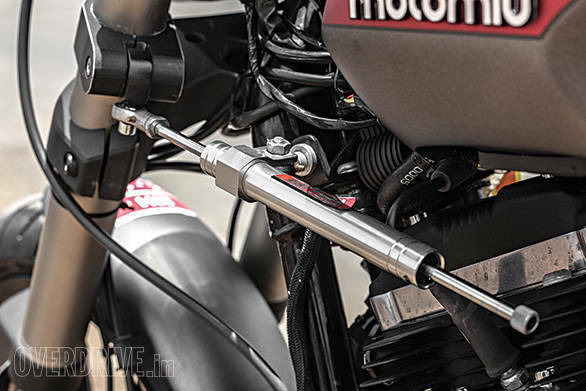 The rear shock too has been tossed in favour of a custom-made swingarm suspended by a single shock from WP. Both front and rear suspension are attached to new 17-inch alloy wheels that have sticky Pirelli Diablos wrapped around them with a 300mm floating petal disc brake set-up up front. Aside from the custom-made bits, the Sabretooth uses some parts from Harley's custom catalogue like the footpegs, shift levers et al. 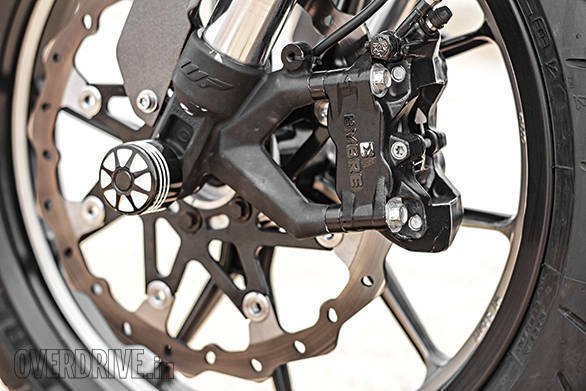 There are also some RSD parts like front brake and clutch levers thrown in and also a fully digital speedo unit from Daytona. Motomiu didn't leave the engine in stock tune either. The Sabretooth gets a custom-made SS 310 L full exhaust system and a Screamin' Eagle stage 1 air cleaner. The motorcycle is beautiful and the finish levels are excellent. The paint work is immaculate, and the machined aluminium bits with their powder-coating could have come straight out of a factory. The workmanship on this motorcycle is top-notch. But the big question is how does it ride? Thumb the starter and the noise the V-twin makes through the custom exhaust is ridiculous. It is almost straight pipe kind of loud. 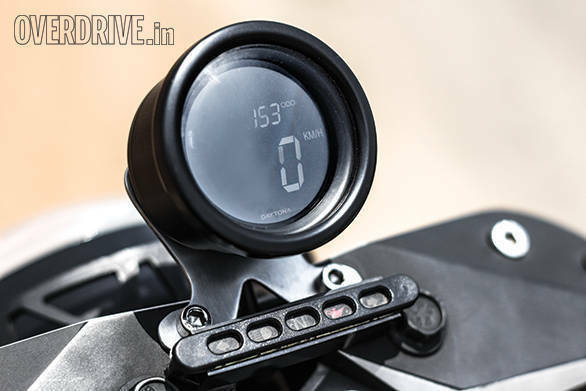 The clutch is a bit heavy, but once you do flick the motorcycle into first gear and start letting the clutch out, the torque coming your way is quite alarming. 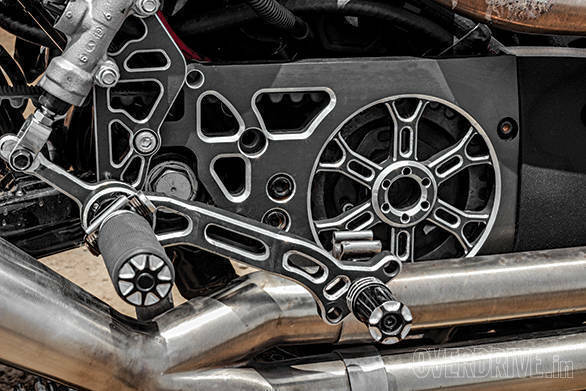 In typical H-D fashion, the tremendous low down torque lets you move around without any throttle input. And the performance itself, once you get going, is pretty good. Much like a stage 1 tuned Harley usually is. What's really impressive about the Sabretooth though is the way it handles. 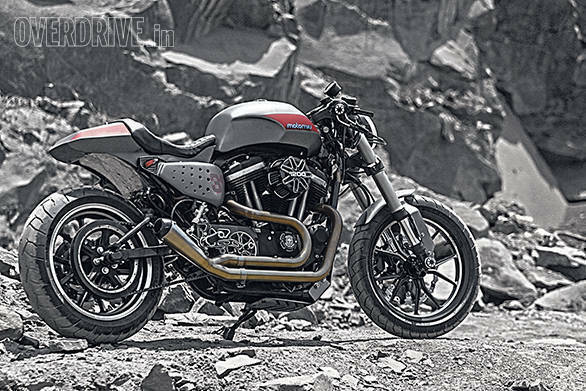 The suspension and geometry changes to the motorcycle have given it a new-found agility that you otherwise do not find in a Harley. Turn in is quick, and the motorcycle has a lightness in its handling that makes it a joy to corner. The sticky rubber and upgraded suspension have done wonders to this motorcycle's handling. The new suspension has also helped increase the ground clearance a fair bit. This means that the bike can now be leaned over more than the cruiser it is based on. However, the motorcycle does have some issues that needs addressing. First is that the exhaust pipes do not have any heat protection. We tend to use our legs to hold on to our motorcycles a lot (as should you). The problem here is that the Sabretooth has a bend pipe coming from the rear cylinder that is routed through where your left knee usually is. Grab the motorcycle tight, and the pipe will burn a hole through your pants. It takes a conscious effort to avoid this. However, this problem can be easily fixed with some heat wrap or a small heat shield. 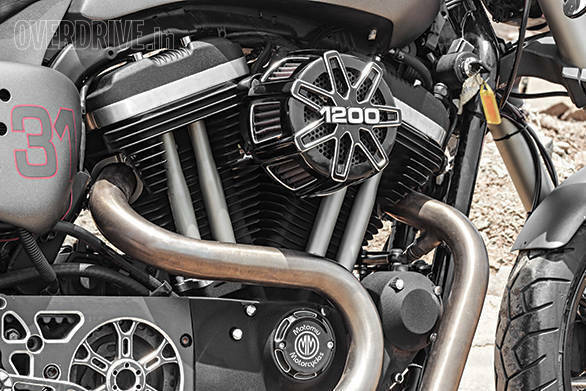 The other issue is that the 1200 engines from Harley have a rather wide bottom half. This creates a bit of a problem when it comes to mounting the footpegs and foot levers. Your feet are left a bit too wide on the pegs, and this can get a little awkward and at time, tiresome. 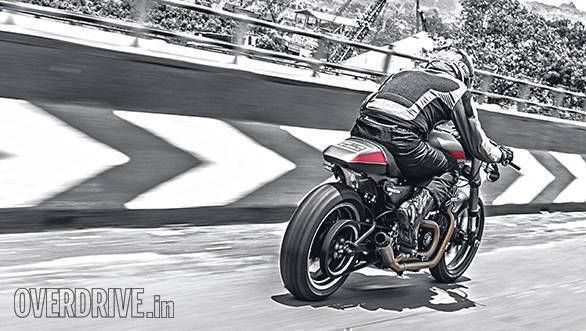 But there are mere quirks, and quirks are one of the trademark characteristics of custom motorcycles. Despite the few quirks that the Sabretooth has, this is one motorcycle that always makes your jaw drop. It looks special and that is what custom motorcycles need to do. Motomiu's motorcycles have always been excellent machines with brilliant build quality and have a sense of having come from a factory. The finish levels are really that good. The Sabretooth is no different. It feels special and turns heads wherever you go. If you want to stand out from the crowd, then this motorcycle will definitely help you do it. A conversion like this costs roughly Rs 8 lakh. Of course, this is not including the cost of the donor motorcycle. And while the Sabretooth has not been made as a kit that you can purchase to customise your Forty-Eight, a lot of the custom-made bits will be available to buy as bolt on parts very soon. But if you do want Motomiu to create you a work of art, then hit them up on Facebook or Instagram. And while you do that, we're just gonna go and stare at the Sabretooth.